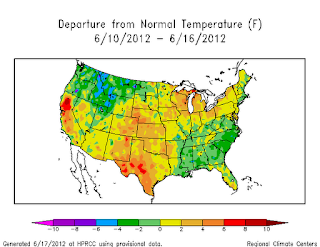 June 19 Update: The National Climatic Data Center confirms the 27th consecutive warmer than normal week with an adjusted average of +0.7°F (vs. the 1.8°F unadjusted average, see below). The month-to-date average for June is +0.6°F. 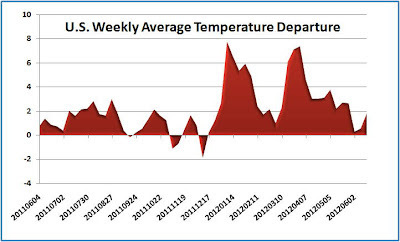 Preliminary National Weather Service (NWS) data indicate that the U.S. national average temperature has now entered the 7th consecutive month of warmer than normal weekly temperatures. The week of June 10-16, ending yesterday, was the 27th consecutive week of above-average temperatures in the contiguous 48 states. The average temperature for 215 NWS stations was 1.8°F above the 1981-2010 climatology, up from the preliminary 0.9°F the previous week. While the Southeast enjoyed near to below-average temperatures, most of the rest of the country, with the exception of the Pacific Northwest, Northern Rockies, and parts of New England, was above average, with the largest deviations in northern California and southern Texas. Only 15% of reporting locations were cooler than average. The warmest individual location was Redding, California (CA-RDD) at +10°, and the coolest was Glasgow, Montana (MT-GGW), at -4°. 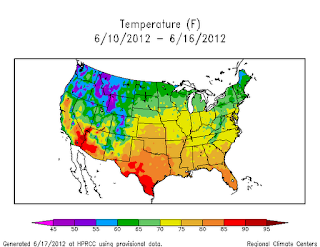 And this week will almost assuredly be 28, with the big heat out west spreading east. Looks like most of the country will experience the heat wave this week.